CSKA Sports Society takes into its structure amateur rugby club CSKA and promises to build a stadium. What about Monino'sn new stadium? Budjet RUR in 2019 is growing. Is this due to RWC qualification or from other sources? No data. Perhaps this is money from sponsors that Artemyev found. Similar contacts ocur not only at CSKA but also at Dynamo. 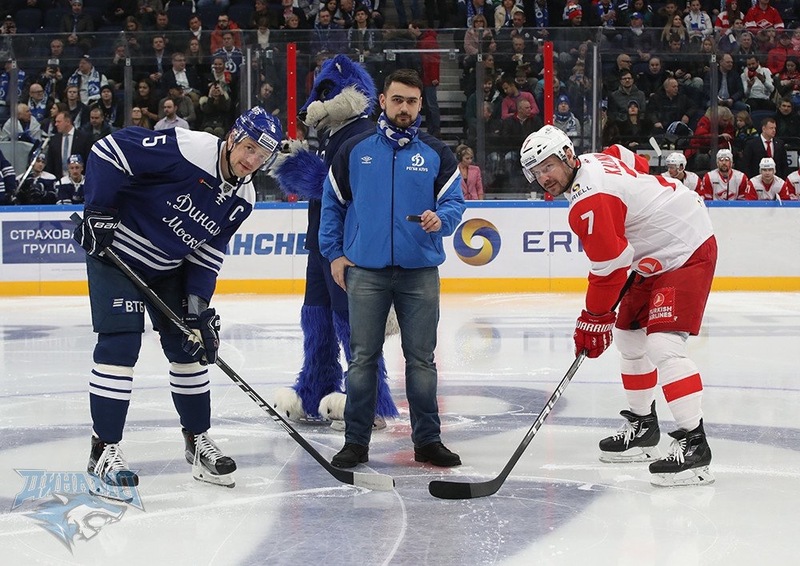 Throving the puck before start of Dinamo Moscow-Spartak Moscowhockey match was made by captain of amateur rugby club Dinamo Yegor Kolosov. 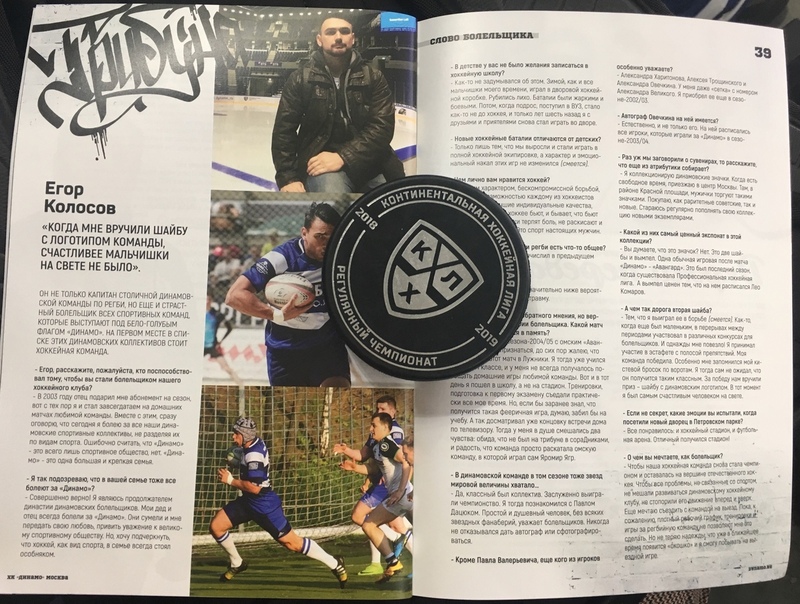 This is a match program with a story about rugby Dinamo Moscow. As for Bulava Taganrog no news yet, but they used to have some good players when they played in RRPL few years ago. They will play this season. In total 8 teams will play. Penza and Taganrog will be add. Lin Jones called 26 players who will go to Madrid to play against Spain. That’s a strong team with Ostroushko, Simplikevich, Ostrikov included. I think Russia will win. 4N wrote: That’s a strong team with Ostroushko, Simplikevich, Ostrikov included. I think Russia will win. Im not sure that level of game in Russia will be same as in fall. In winter we traditionally look much worse. I have very good news for all Russian rugby fans. As I understand (and I trust Google translator) rugby official from Russia is full of optimism and promises that soon russian team will reach level of All Blacks and Springboks . “Dmitry Morozov, a member of the Rugby-7 Development Committee, spoke with Soviet Sport at the Russian Investment Forum in Sochi. He probably talks about rugby 7. Our women beat New Zealand, Australia and South Africa. Georgia is not a competitor to us. In general he is not a rugby player, he is a wrestler judo. Sevens and what we should aspire to. You can only applaud the masterful trolling which brought about the belter of a sadly-now-deleted post by RugbyPubTbilisi. I managed to read, but did not have time to answer. Lets not depreve Georgia of only joy rugby brings to it. Vova12 wrote: Our women beat New Zealand, Australia and South Africa. Agreed, Russian women are N1 in the world! May be compared to Scandinavians, certainly not Maori women. Russia is ahead in this particular case. We just need to start thinking about Georgian women more so we reach 150million marker. fullbackace wrote: We just need to start thinking about Georgian women more so we reach 150million marker. The fact is that Moscow (княжество) principality turned into Russia, and the Georgian (царство) kingdom became Georgia because Russians know how to turn enemies into friends, and Georgians do not. You should be in comedy club!!! Martirosian will be glad, having you. At least stop messing up rugby. poor Romanians left out because of you. RWC spot was not won or deserved by Russia, it was gained by lawyers and men from FSB. I do not consider it fair to take part in tournaments in in off season. When your win in fall then i agree with you. It seems you are living 'in another world'. The last bottle of boyaryshnik (Crataégus) was unnecessary. Don't drink it. In response to "boyaryshnik" i probably have something to write about frogs? I have to explain my words. The main achivement of modern Georgia is rugby. This is only achievement. Vova12 wrote: I have to explain my words. Also Georgia dropped corruption, Crime, got freedom of speech. developed Education and Tourism.